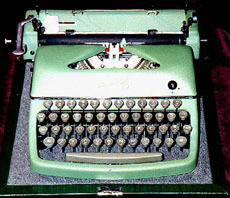 TY-351-Green Typewriter made by Rheinmetal Co. Looks like it just came out of the factory. It weighs 18 lbs. The case is also in good condition. All ready to ship to you to be placed on your desk. This machine does work well. Price $90.00.